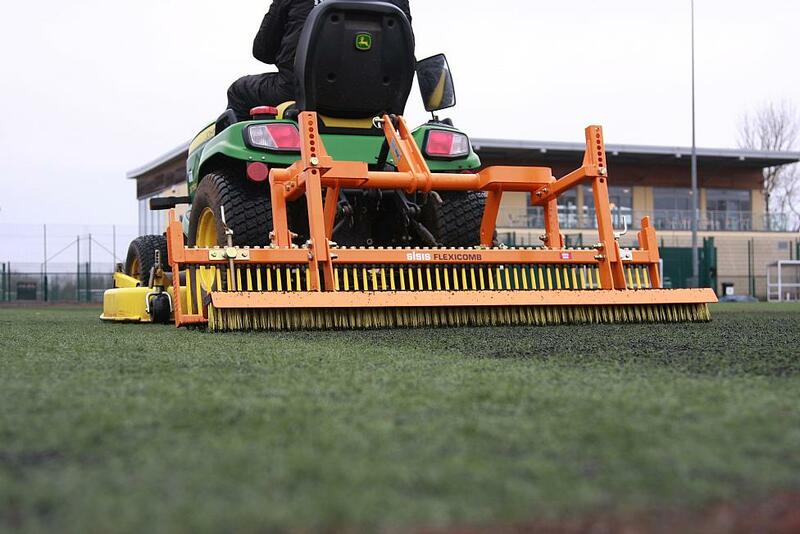 Lee Ballard, senior groundsperson at the University of Kent (UKC) in Canterbury, believes that his new SISIS Flexicomb is the perfect tool to help extend the life of one of the University’s synthetic sports surfaces. Canterbury in Kent may well be known predominantly as the place of Thomas Becket’s murder at Canterbury Cathedral or for Geoffrey Chaucer's 14th-century literary classic The Canterbury Tales, but it also boasts an internationally recognised university. Ranked in the top 10 in the UK in a national student survey, with over 5,000 students from different nationalities, the University of Kent has a reputation for academic excellence. It also has outstanding sports facilities, which includes two grass football pitches, two grass rugby pitches and synthetic sports surfaces. Overseeing the maintenance of the sports pitches is Lee Ballard, who admits that one of the synthetic surfaces requires extra special attention due to its age and heavy usage. “We’ve had one of the pitches for nearly 12 years now and that houses full-size football games, four five-a-side pitches and lacrosse games. It gets a lot of usage and is used from 5pm until 10pm seven days a week. You have the students who use it as well as local sports clubs and Gillingham FC’s academy teams. “The pitch has had years of not having the best machinery to get deep enough to give it a good clean and we are trying to extend the life of the surface as much as we can,” he said. The common misconception is that synthetic surfaces are maintenance free. Just like natural turf surfaces, synthetic surfaces require maintenance as soon as they are constructed if they are to perform to the standard expected of them. Regular brushing along with periodic aggressive brushing and maintenance is required to ensure that the playing surfaces achieve their full life expectancy, and to help Lee with this task he chose to purchase the SISIS Flexicomb. “When I first started in this role my aim was to improve the synthetic surfaces. Previously we were using a machine which just had tines on it and it never seemed to do a very professional job. So, we started looking around and I saw an online video of the Flexicomb being used at Tottenham Hotspur. It looked great so I took all the details down, passed it further up the chain to say this was the machine we needed, and luckily there was money in the budget to purchase it. 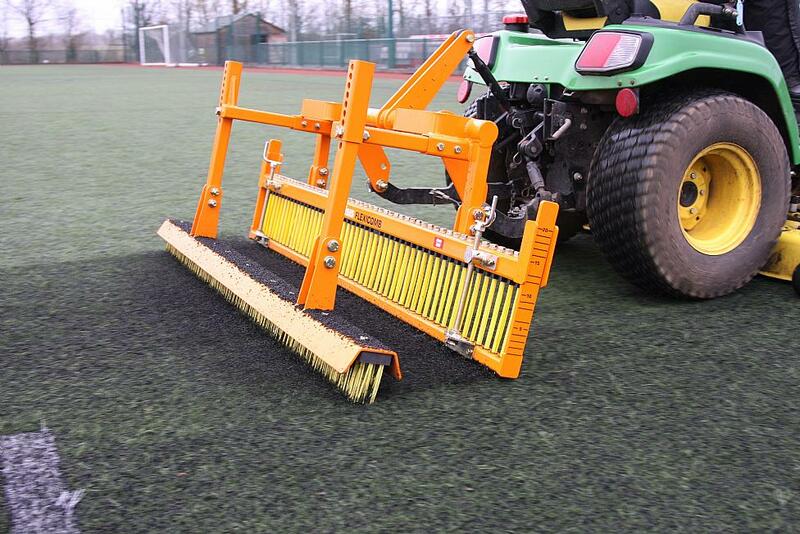 Designed primarily for use on synthetic surfaces, the Flexicomb ensures even distribution of infill materials and lifts the pile. The adjustable setting ensures the effect of a rake, but with the softness of a brush, reducing the risk of damage to the fibres. 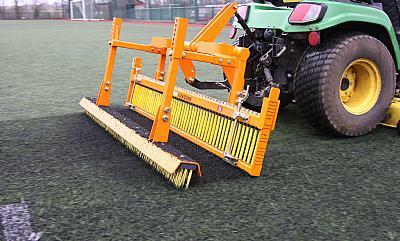 The bristle sections are replaceable and the Flexicomb is designed for a long working life with minimal maintenance. Furthermore, it can be used with SISIS Singleplay, Twinplay or Quadraplay mounting frames, which can all be connected to any tractor with 3 point linkage and utility trucks with suitable frames. “We tend to use the Flexicomb three times a week depending on the maintenance schedule and make sure we give the surface a good brush after every ten hours of usage,” says Lee. “Sometimes we will double brush it both ways if time allows. “It has so many good features – I like how easy it is to set-up and how simple it is to use. It does such a good job and leaves you with a great finish which is important because presentation is key. I also like how you can be slightly more aggressive on the ground and get in and move some of the crumb about and get rid of some of that compaction.